In a 1999 San Diego Reader article covering raves in San Diego, James McCoy writes about finding himself in the midst of a MDMA-fueled party taking place somewhere on the UC San Diego campus. Noting the abundance of ravers adorned in winged-creature outfits and flowing dance patterns, the writer finds a rave-goer who explains the environment as being "free and stuff," a place where "they can take off anywhere." The article proceeds to describe the rave scene in San Diego in the late ‘90s almost as a living, breathing phenomena, one that celebrates it's ability to thrive as both an underground treasure and pop cultural force taking the nation by storm (or setting the stage, at the very least). 20 years later, our rave and electronic music culture still thrives within the same dichotomy. As anyone who's ever looked into the pupils of virtually anyone at a OMFG! or been to SPIN Nightclub past 3am can tell you, electronic music culture's influence and power is still alive and growing more than ever in San Diego. 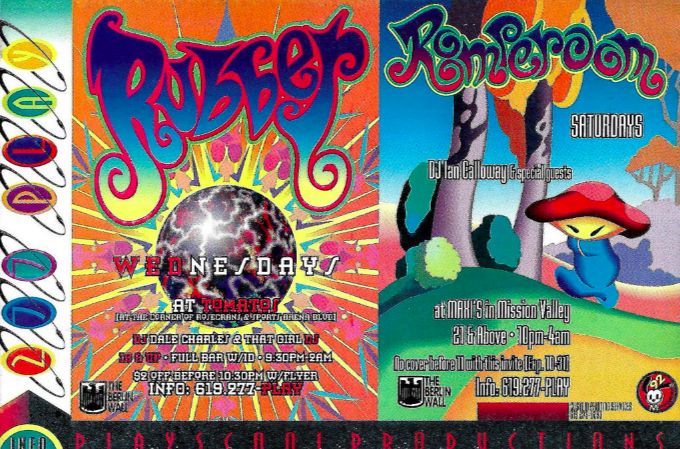 To celebrate 20+ years of underground music parties in San Diego, and in light of our own big event this Friday, we wanted to a look back at some of our favorite San Diego rave flyers from the ‘90s, spanning 1994 to 1999, as collected by rave-going veteran, Ernie Villalobos. Check the collection and marvel at the history below.